I have been living in Munich for more than three years and up until now have only visited Starnberger See, thanks to work, Garmisch Partenkirchen to go skiing and Augsburg and Neuschwanstein which were part of school trips. Since I had my one week autumn break David and I were looking for a cheaper option for our holiday, this is when we came up with the idea of seeing a bit of our own backyard. Hence the commencement of planning a week-long road trip around Southern Germany. We asked friends and colleagues for recommendations and did a bit of our own research. I finalized the itinerary over a weekend that David was away for work. When I told him the plan and that it was action packed in terms of seeing a lot of cities, he berated me and said we had agreed to do more relaxed, slow-paced trips. I told him he was very welcome to make decisions about which destinations to cut out. Once he saw pictures of each the intended destinations I think his comment was something like, “Wow, you really have chosen some of the most beautiful places”. Needless to say we did not reduce the number of stops. To say it has been exhausting is an understatement but at the same time we have really had a taster of what Bavaria, Saarland, Rhineland-Palatinate and Baden-Württemberg has to offer. We were of course restricted with the one week and could have definitely reduced the number of stops by half. However many of the towns are small and we feel like we sampled each sufficiently. Plus some of the towns are easy day trips from Munich so we knew we could easily go back if we so desired. In all honesty two nights would have been good for each of places we visited which includes an arrival day, a day to explore and then a departure day. Be aware that if you go on a road trip in Germany you will find many road works and detours (Umleitung in German). It all sounds great that you can drive on some parts of the Autobahn (freeway) with no speed limit but it is almost guaranteed that you will encounter road works that will slow you down or a detour that will throw your GPS into a spin. These problems really slowed us down on some days and made our visit to some of the towns quite rushed. The problem is not that the roads are in terrible shape, in fact the opposite. It is that some of the states are very wealthy and have too much money to spare and need to spend it so they get the same funding the following year (or so I’m told). Side note to government, feel free to reduce our taxes instead of unnecessarily “fixing” the roads. Rant over. We would still be lost trying to get to Konstanz if it wasn’t for our GPS, this is why we would recommend having one on every road trip. They come in super handy when you encounter a detour, as well as of course helping you get to your destination or getting you back on track when you miss a turn like someone I know (cough, cough ?). Maybe we are just rookie road-trippers with a terrible sense of direction. Have you gotten really lost on a road trip before? We had tossed up the idea of finding hotels as we went along so that we would have more freedom with our itinerary and wouldn’t have felt so rushed and could stay in places longer. However, in hindsight we are actually glad we pre-booked our hotels because we didn’t really have time to drive around looking for a hotel in a good location or sitting online reading hotel reviews so in this respect we saved a bit of time and stress. 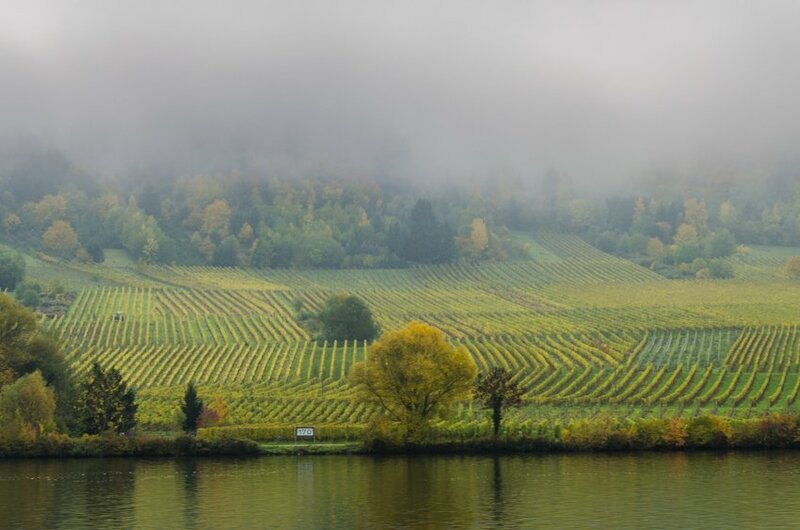 We knew the weather would not be amazing but we were hoping the autumnal colours through the Black Forest, along the Moselle Valley and Romantic Rhine would make up for it. And it did! Unfortunately, due to it practically being winter in this part of the world our days started with a thick cloud of fog in each city. Even though fog can add to the atmosphere of a landscape, it can also detract from the detail and colour in a photo – not ideal when one of the main reasons for the trip was to take photos. An old lady walking her dog even commented to me that I needed the sun shining on the gorgeous trees while stopped on the side of the road trying to capture the magnificent scenery. So, “where did you go?”, I hear you ask. 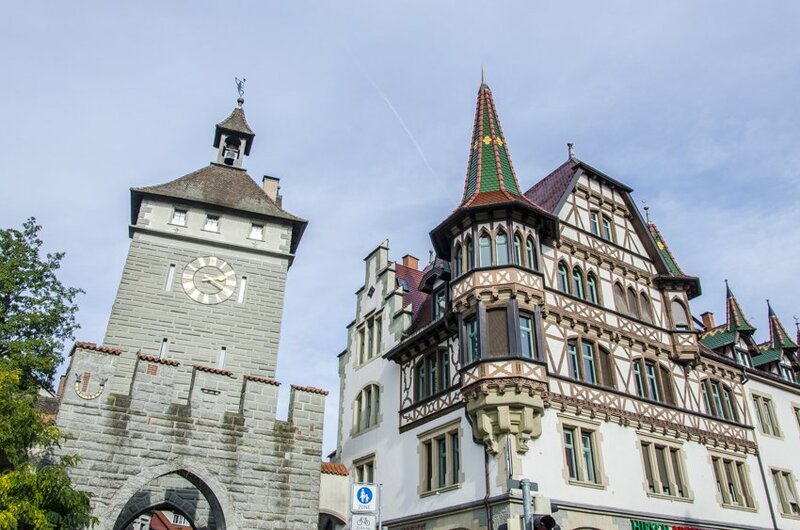 We left Munich and headed south-west to Konstanz. Lake Konstanz (also called Bodensee or Constance in English) is bordered by Germany, Switzerland and a little part of Austria. After getting a bit lost and accidentally going through Austria and Switzerland we arrived there safely. It is a cute medieval town that is easy to walk around. We arrived on a Saturday and finding parking was an adventure on its own, however perseverance paid off. Due to our mishaps earlier in the day time had gotten away from us so we decided to skip our next planned stop of Titisee (is it only the immature me who giggles at this name?). So off we went to Triberg. 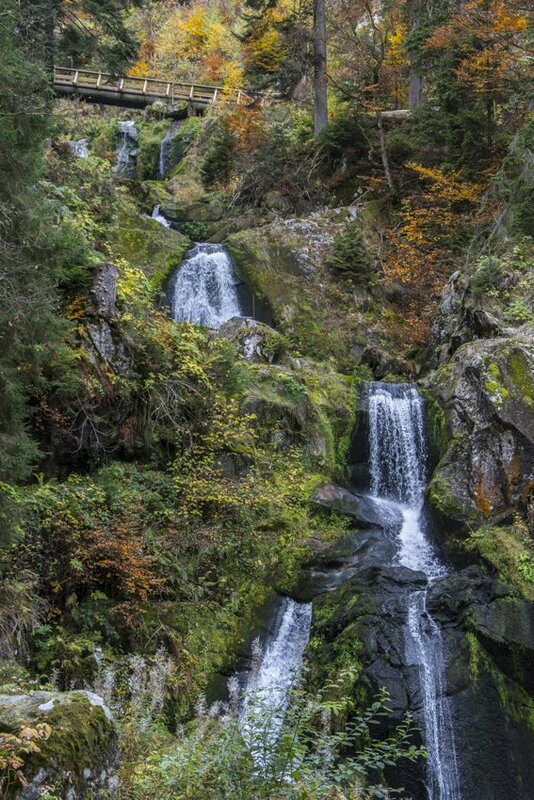 Triberg is a very small town that I’m sure is kept alive on tourists going to see Germany’s highest waterfall, which I have to admit is a little underwhelming but the walk through the forest during autumn was magical. Some tourists may also choose to visit what is claimed to be the world’s biggest cuckoo clock, DON’T do it! After a morning of fresh mountain air we headed off to Freiburg through the Black Forest. 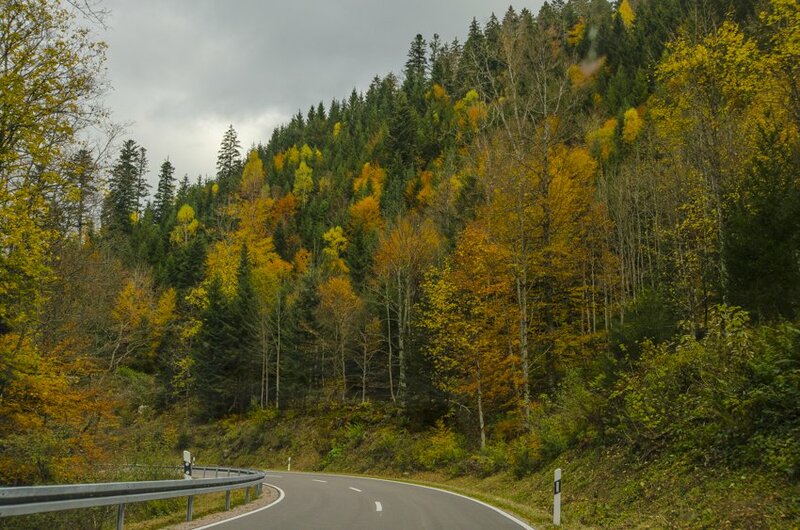 This stunning drive cannot be recommended enough during autumn. I could not take enough photos of the beautiful scenery. 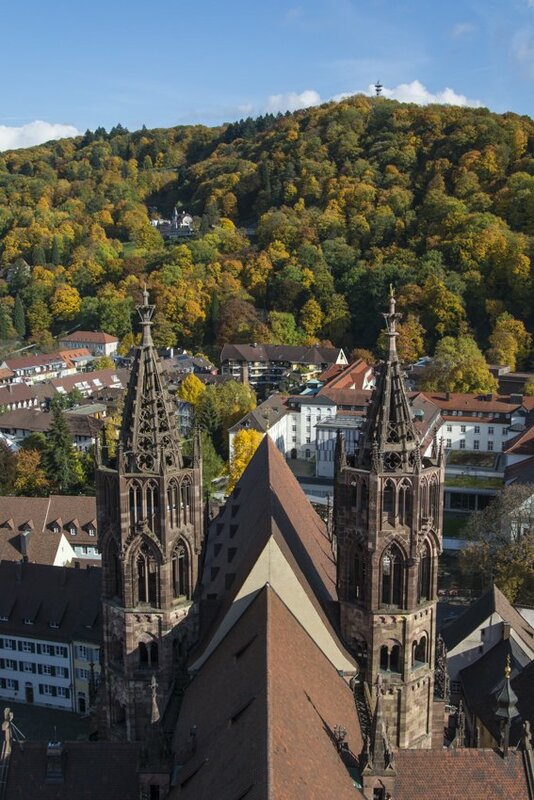 Freiburg is another cute medieval town with a fantastic cathedral dominating the skyline. 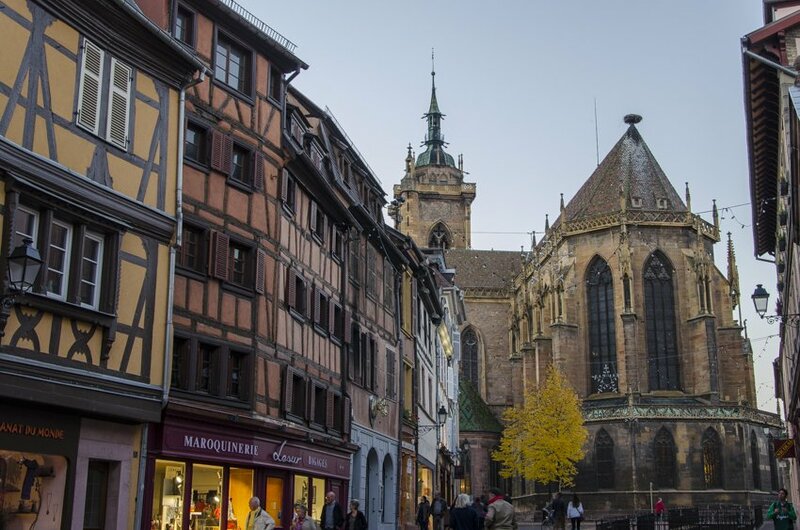 Then it was on to Colmar in France. I’m not sure where we heard about this beautiful little town near the French border but I think it was my favourite place of the whole trip. The old town is inundated with colourful half-wooden style houses and majestic churches. We definitely need to go back there. It was then on to Strasbourg for the night. I had been here before but David hadn’t and I was happy to visit it again, especially during a different season. 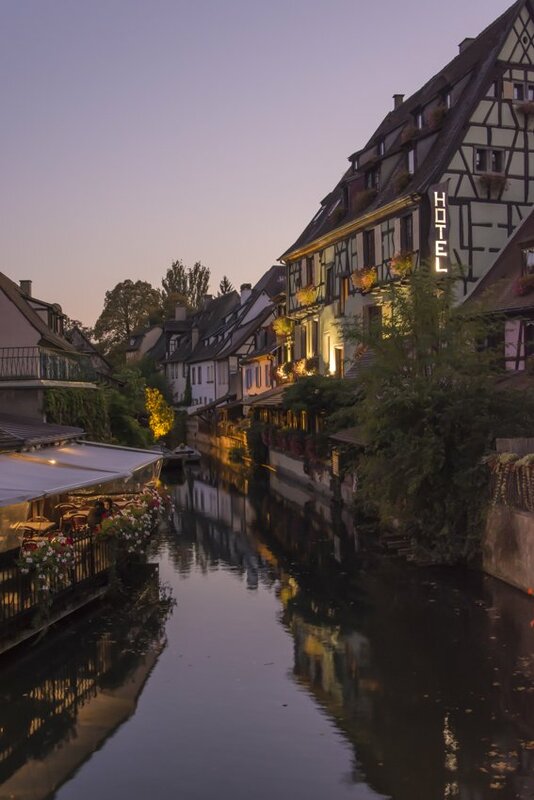 You can easily lose track of time wandering the quaint streets of Strasbourg as well as covering all of the main tourist attractions. That afternoon it was back to Germany to Trier with a stop at the Saarschleife, where the Saar River does a hairpin bend. Magnificent views and a drive through some cute towns made this pit stop worthwhile. 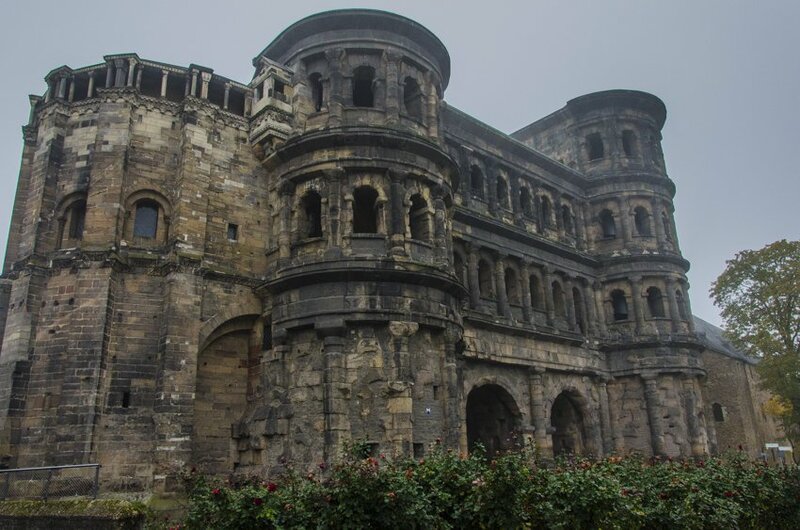 After a morning of surprises of ancient Roman ruins in Trier we drove through the Moselle Valley towards Koblenz. 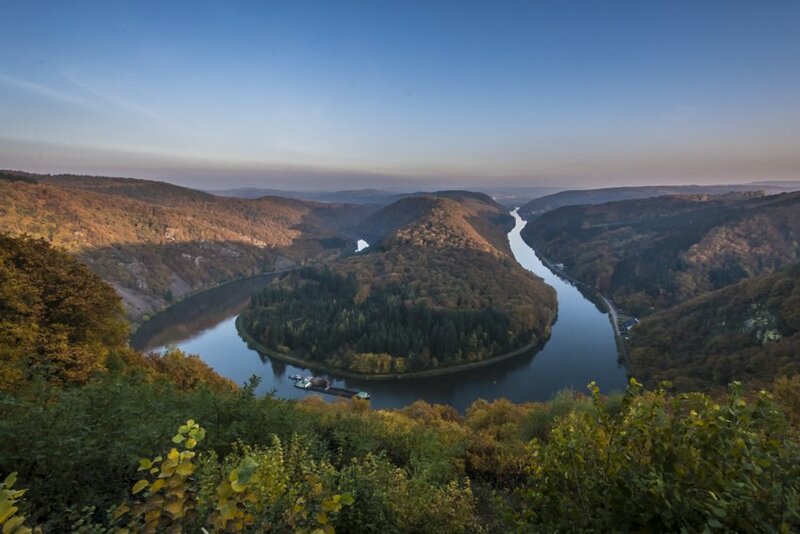 I was really looking forward to the next two days of driving as I had heard so many impressive things about the areas along the Moselle and Rhine rivers and I was not disappointed. Thankfully the sun decided to shine for us in the afternoon so we could really appreciate the steep hillside wineries where the vines had already turned golden, with a backdrop of gorgeous autumn trees. 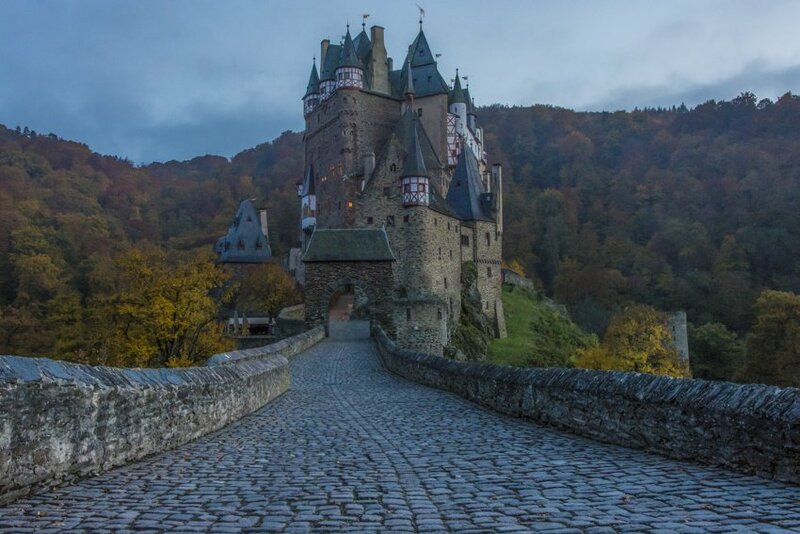 On our way to Koblenz we had a brief stop at Burg Eltz (Eltz castle) thanks to a recommendation from a friend. It was totally worth walking back to the car through the creepy forest in the dark. It is a fairytale castle that has managed to stay in its original state, probably due to its seclusion, set amongst a thick, lush forest that was absolutely stunning in autumn, as I’m sure you’ll agree. 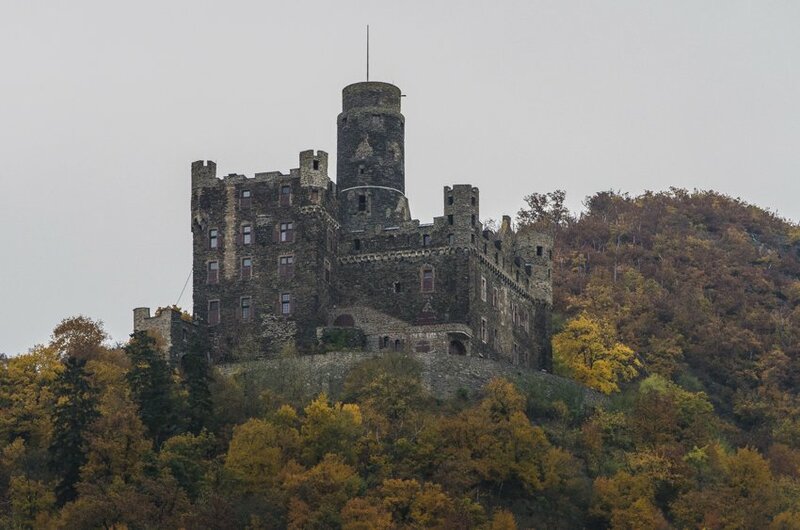 Koblenz was basically just a stopping point between the Moselle Valley and the Romantic Rhine. In hindsight, we would recommend that you stay at one of the many cute little towns along the Moselle and/or Rhine rivers instead of Koblenz. 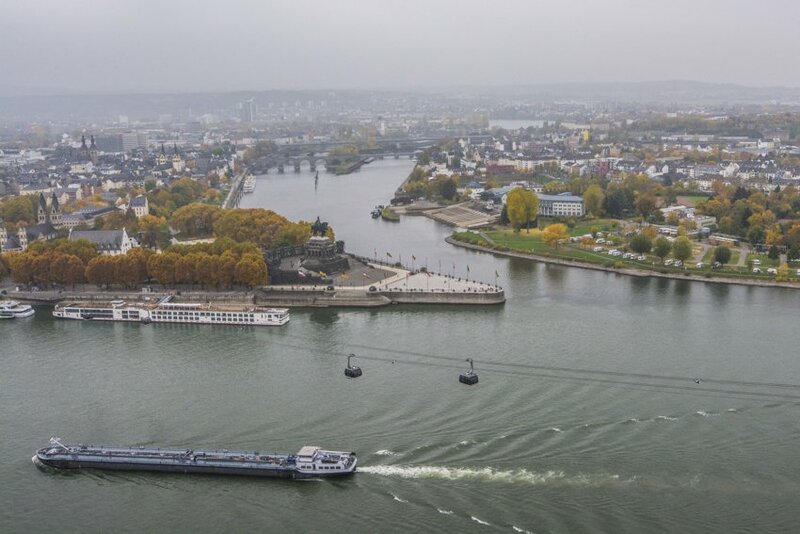 Koblenz’s main tourist attraction is the Deutsches Eck, where the Moselle and Rhine rivers meet. If we had had better weather we may have appreciated the view from the fort that looms above both rivers a little more. We were not a happy pair of photographers with all the fog we were encountering. After leaving Koblenz we drove along the Romantic Rhine on our way to Heidelberg. as with the Moselle Valley, the scenery caused us to stop every ten minutes to take photos. This time we not only had the steep vineyards, a river and the beautiful colours of autumn to impress us but we also had majestic castles towering above the river dotted along the route. An obligatory part of any road trip in the south of Germany in our opinion. 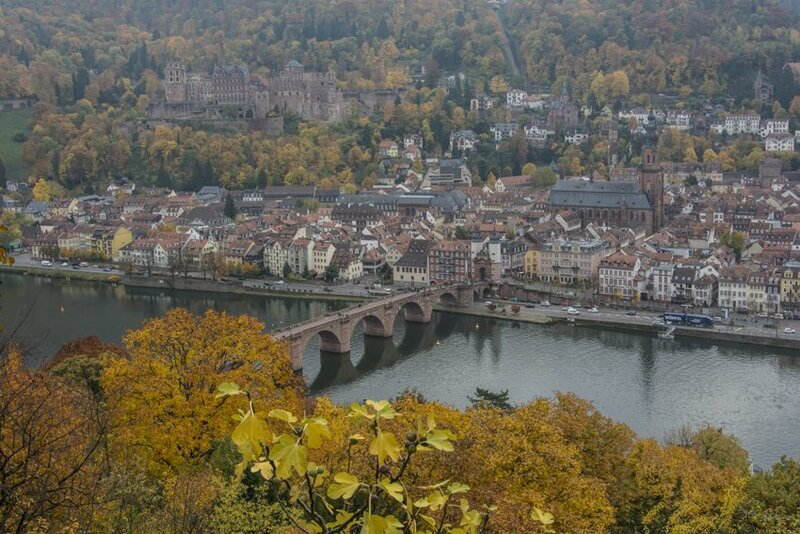 Heidelberg’s cute and cosy old town impressed us and the variety of history and sights to see surprised us. Germany’s oldest university town is definitely worth a visit, including the old university jail (more to come on that), Castle Heidelberg that overlooks the city and a walk along Philsophenweg to gain great views of Heidelberg. After spending far longer than we had planned in Heidelberg we headed off to Rothenburg ob der Traub. Arriving at our hotel that was in a building over eight hundred years old was certainly a good start to our visit. We had heard that it is a town on the tourist route and can feel a little overcrowded with the hoards, however we didn’t feel like this at all. Apart from some small groups of Japanese tourists taking selfies in the main squares we felt like we had most of the place to ourselves. The town is filled with cute, colourful half-wooden houses, gorgeous views and a city wall that you can walk along in parts. We would like to visit again in winter to see the Christmas market as we envisage it to be even prettier then, plus the guy at the hotel said that very few tourists visit in winter! 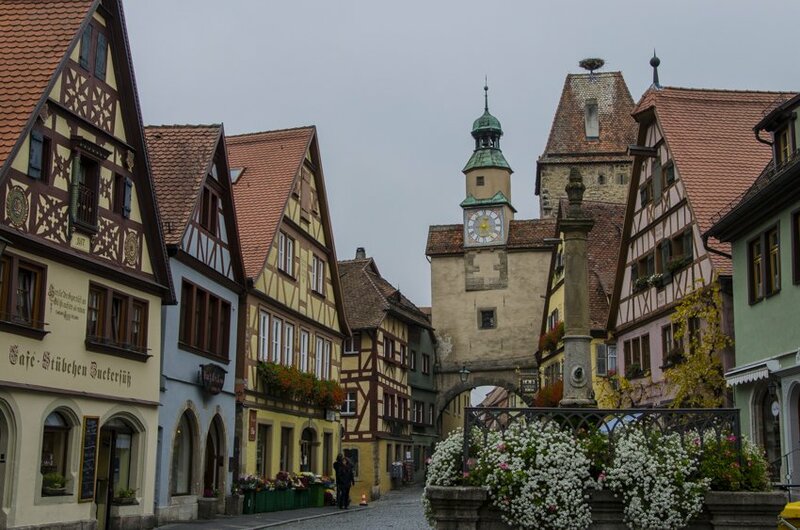 To see more about our visit to Rothenburg ob der Tauber read our post by clicking here. We reluctantly dragged ourselves away from Rothenburg and headed to Nurmeburg (Nürnberg in German). Nuremburg has two parts to its history, the Altstadt which contains all of the history from hundreds of years ago, including towering Gothic churches to the house of one of Germany’s most famous artists, Albrecht Dürer; then there is the major rise and demise of the NSDAP (Nationalsozialistische Deutsche Arbeiterpartei – National Socialist German Workers’ Party), more commonly known as the Nazi Party, that happened in Nuremberg before, during and after WWII. Since we had limited time in Nuremburg and had already seen a lot of Medieval towns we decided to focus our time here on the recent history. 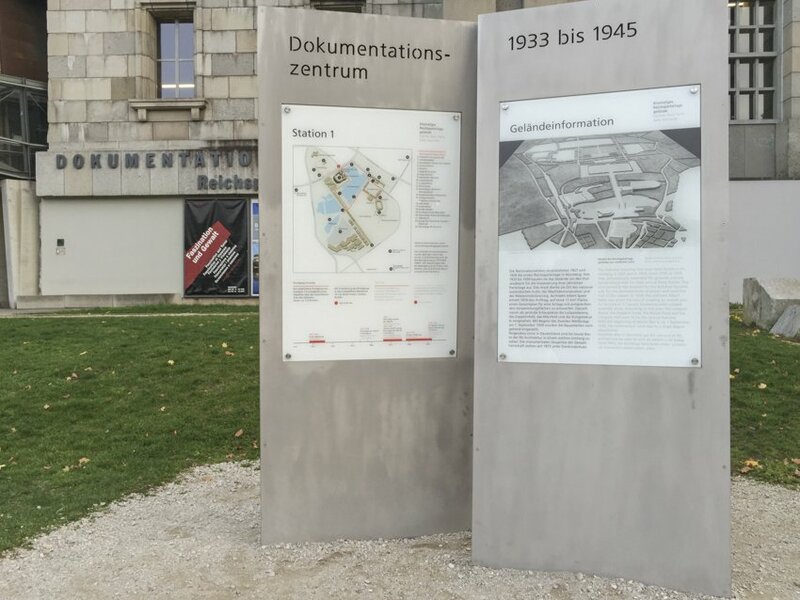 We decided to visit the Dokumentationzenrtum. You can arrive there with tram 9 from the main train station (Hauptbahnhof) heading to Doku-Zentrum, it is the last stop and only takes about eight minutes to get there. This is an incredibly informative, well presented exhibition that is factual and presented in a neutral way. It starts with the beginning of the NSDAP and how they came into power, the establishment of the buildings around Nurmeburg and their role in the propaganda of the day and then it briefly touches on the Nuremburg trials (you can visit where the trials actually took place in another part of town but we didn’t have time to visit) that aptly happened in Nuremburg after the war, sentencing many of the main party members for war crimes. We were only there for just under two hours and it was not enough so allow yourself at least three hours to truly take advantage of this insightful exhibition about Germany’s recent history. And if you have some more time to spare go stroll around the eleven square kilometres of the old nazi party rally grounds to get an impression of the megalomania of this party’s leaders. Since the Dokumentationzentrum closed at six o’clock we decided to have a sample of Nurmeburg’s old town at night (well in the dark anyway). It is a nice city but being Bavaria’s second biggest city we felt like it was similar to Munich, where we live. However, that is not to say that there weren’t interesting sights to see. We also needed to get to Regensburg that night so we were a bit rushed for time, a recurring theme on this trip I know. 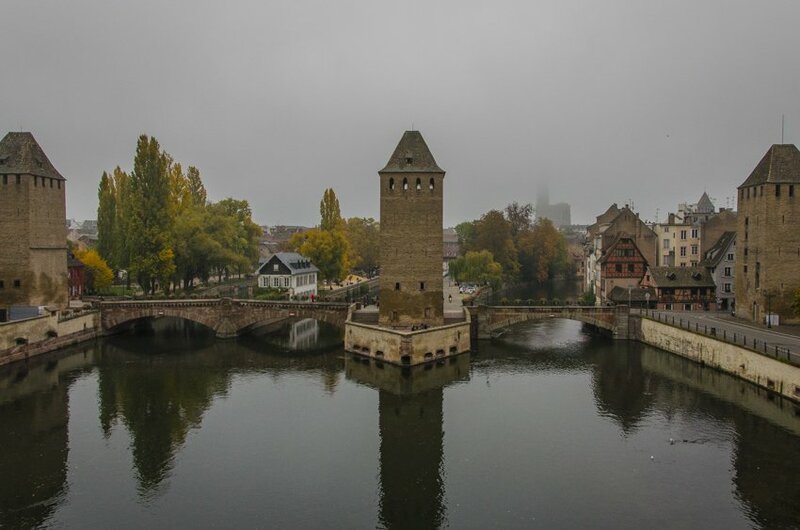 After seeing this amazing video of Nürnberg from the radio station Antenne Bayern we definitely need to go back again! Arriving at our hotel in Regensburg was a bit of a challenge as after missing the original turn we should have taken (yes it happened again, a regular occurrence on our road trips!) our GPS went into a tail spin and directed us down a very narrow cobble stoned street, actually more like a laneway, that the car could barely fit down and then told us to turn into an equally small street which took quite a bit of reversing and driving forward again and again, to do. The lesson here is if you are staying in the Altstadt in Regensburg make sure you have very clear instructions of how to get to your hotel in advance :-). 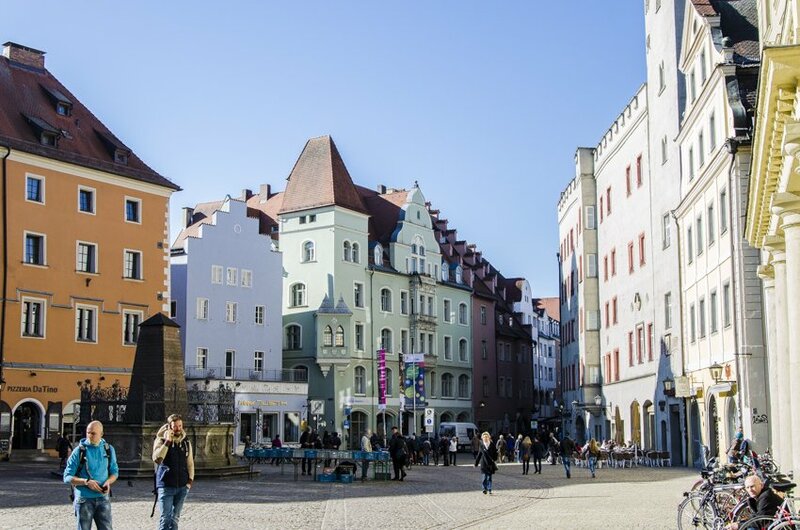 Regensburg is a collection of cute squares, impressive churches and cobble stoned streets that are mostly pedestrianised and allow you to wander aimlessly for hours. 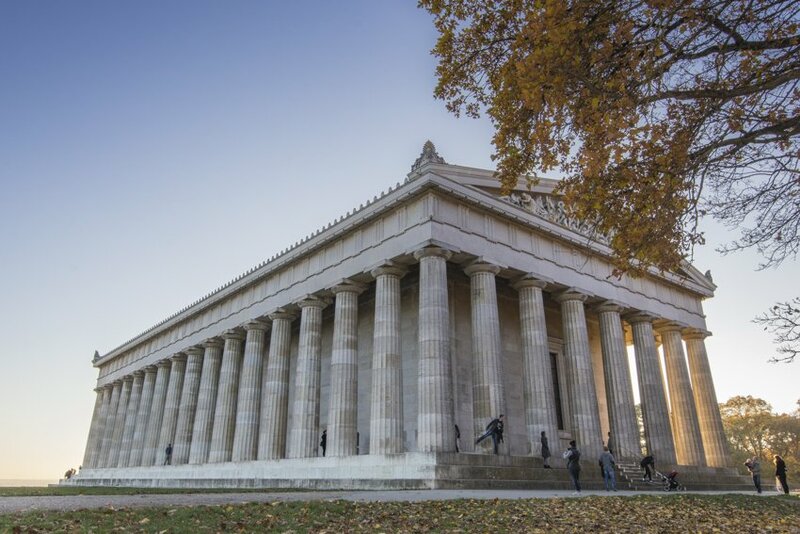 When leaving Regensburg we took a detour to Walhalla, a replica of the Pantheon in Greece overlooking the Danube commissioned by Ludwig I. It sounds weird I know but it was actually quite pretty with the sun shining and sitting high above the river contemplating the meaning of life and reflecting on what was a wonderful week exploring our backyard of Southern Germany. Unfortunately we had to leave out Nördlingen, Kallmünz and Bamberg which were also on our list of possibilities, due to lack of time but hopefully we will get to these in the near future. Stay tuned for more posts about the towns we visited and the experiences we had on this whirlwind tour of Southern Germany. 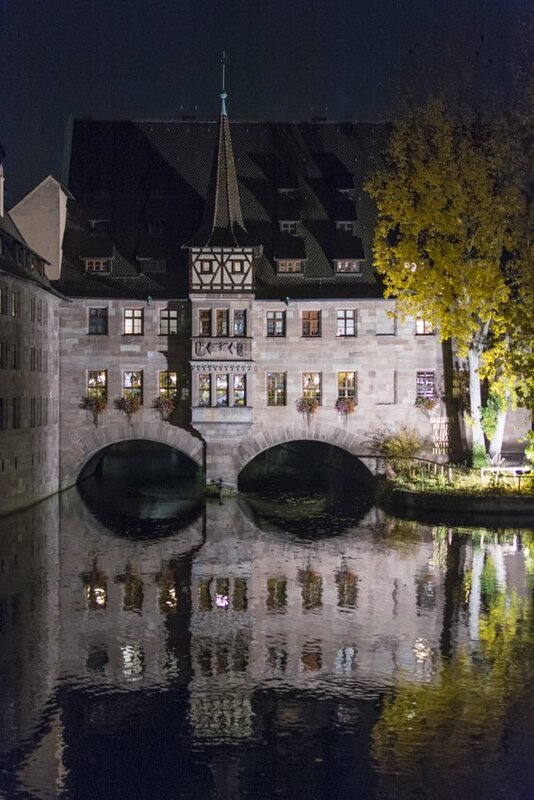 There are so many more great towns to visit in Germany, this trip just whet our appetite for exploring more of them. Let us know other places we should visit or if you have visited any of the places mentioned above and what you thought about them. 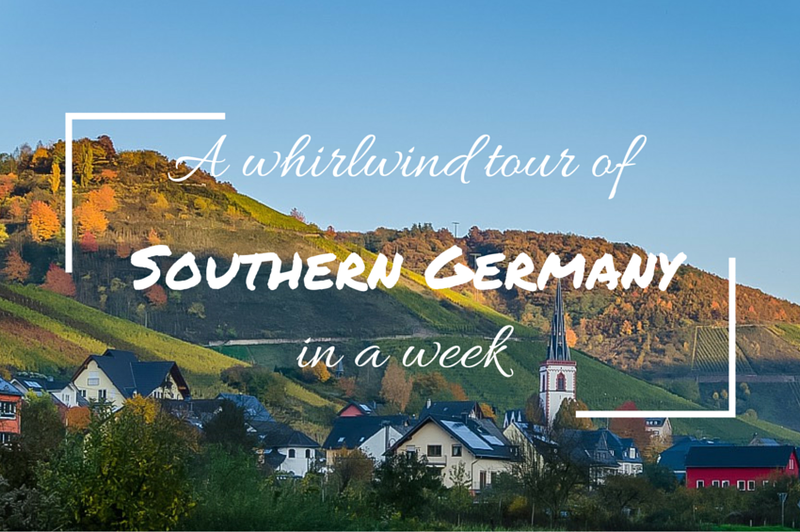 5 Comments on “An Overview of our Whirlwind Tour of Southern Germany in a Week”. Join the Conversation Here! Wow – you did well in one week. Your stories and images bring back great memories of when I visit my sister. 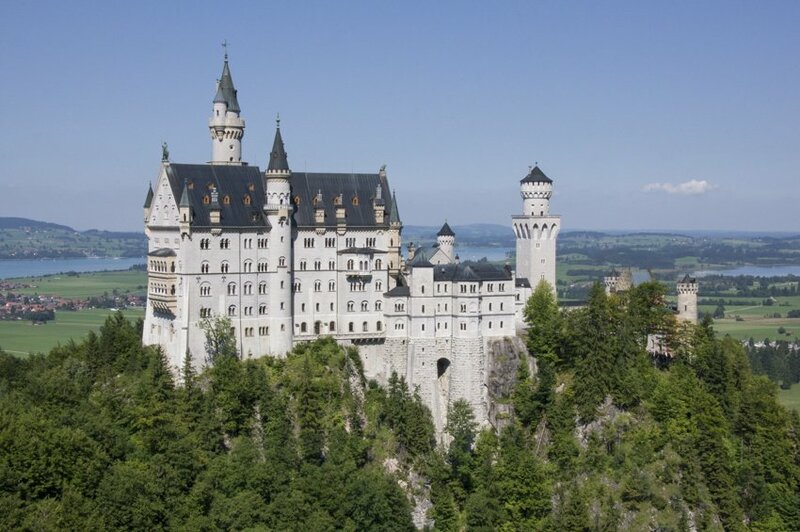 Not sure if I would consider Burg Eltz and Koblenz Southern Germany as such… but then I am from Upper Bavaria and nothing north of Munich was considered Southern Germany… 😉 Well done – love your sense of adventure and the attitude that nothing is too much when it comes to travel and exploration. Hi Anna. To be honest with you that was quite of a challenge, but a pleasant one. So many places in such a short time… but again, that’s what adventures are about and Germany has so much to see that we couldn’t resist. You’re absolutely right, Koblenz and Burg Eltz are a bit north of southern Germany :-D. Cheers! I know the places well and can relate to the challenge of seeing so much (history and landscape wise…). You two did well and reading about your adventure brought back fabulous memories… my husband and did the trek a year ago just prior to Christmas taking in the Christmas Markets at the same time. Keep on traveling and posting – can’t wait to read more about your adventures.